PRODUCT: Retro-Spin® Flashing BASE Only. Constructed of two interlocking galvanized metal components which fits up to a 3" OD size. Price/Each. APPLICATIONS: A Retro-Spin® Flashing BASE is used together with EPDM Retro Storm Collar Top Pieces (not included). Together, they make a a roof jack, or pipe flashing, which waterproofs roof penetrations that do not allow for “slip over the top” installations. CONSTRUCTION: The Retro-Spin® Flashing BASE assembly is constructed of a tightly fitted interior and exterior impact-extruded roof jacks. The patented Retro-Spin® design enables the interior flashing to rotate freely within the confines of the exterior flashing. Each flashing is fabricated from one single sheet of electro galvanized steel using an impact extrusion method that eliminates all soldered seams. Retro-Spin® Flashings are fabricated in the United States from first quality electro-galvanized sheet metal. The life expectancy of a Retro-Spin® Flashing should exceed 20 years. * Center is 3 inches round when closed, and 3 " high. * 4 inch horizontal flange/skirt all around. INSTALLATION: Pre-punched access slots are cut through the sides of the two flashings creating a “Door” that is opened, and closed, via the spin action allow for by its design. Retro-Spin® Flashings waterproof roof penetrations by using their closing door technology that allows for “Slip from the Side” retro-fit installations. Choose the Retro-Spin® assessory Flashings design that is large enough for a roof penetration to pass through the open slot, enter the conical interior of the jack, and allow the flashing to rotate, or spin, closed without obstruction. Hand tools are not needed (used) when placing a Retro-Spin® Flashing around a roof penetration. 2-1/2 inch Retro-Spin® / Retro-Collar Kit. 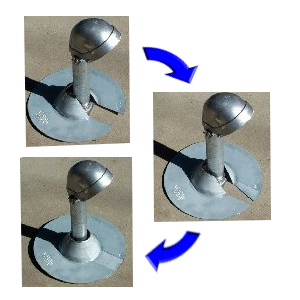 Consists of galvanized steel Retro-Spin Flashing base, 2.875 ID EPDM Retro-Collar Assembly (wrap-around flashing skirt + top plug), & stainless steel band clamp. Fits 2.775 to 2.875 OD & DN65 pipes. Price/Kit. ASI 702114, 1-1/2 inch Retro Split-Collar Pipe Storm Collar. 1.9 inch ID fits 1-1/2 inch nomimal size & DN 40 pipes. Includes Stainless Steel clamp. Price/Each. ASI 702237, 2 inch Retro Split-Collar Pipe Storm Collar. 2.37 inch ID fits 2 inch nomimal size & DN 50 pipes. Includes Stainless Steel clamp. Price/Each. ASI 702875, 2.5 inch Retro Split-Collar Pipe Storm Collar. 2.87 inch ID fits 2-1/2 inch nomimal size & DN 65 pipes. Includes Stainless Steel clamp. Price/Each. 2x2 inch Square Retro-Collar Pipe Storm Collar Kit. 2x2 Inch Square ID EPDM Retro-Collar Assembly (wrap-around flashing skirt + top plug), and stainless steel marine grade band clamp. #702220 fits 2x2 square post. Price/Kit.